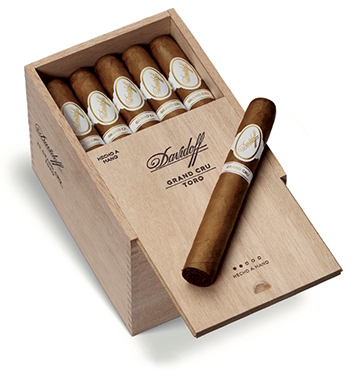 All Davidoff cigars maintain well defined standards of quality and excellence. The tobaccos that are used in the different blends have been cultivated in accordance with the most ancient traditions, in the richest soils and ideal climatic conditions of carefully selected fields. The choicest leaves from various harvests undergo four years of aging, which imparts to Davidoff cigars their rich aroma and consistently smooth taste. All Davidoff cigars are handmade in the Dominican Republic, where for over five centuries this art has been passed on from generation to generation. It is with the Grand Cru's original corona formats Nos. 1 through 5 that Zino Davidoff launched his first cigars in 1946. Blended with Piloto, San Vicente, and Ligero tobaccos wrapped in a beautiful Ecuadorian Connecticut leaf, the Grand Cru is an exquisitely balanced and subtle mild to medium-bodied cigar with nutty flavors, spicy back notes, and a sweet finish.